My Comment: All reports show how everything is interconnected, although in fact, our interconnection is much greater because connections between people, cultures, and the mixing of populations are not considered. Nature programmed further development of humankind in growing unity, and we cannot avoid this program. The more we resist it, the more we will be forced to obey it through more suffering. The laws of nature are inevitable. In previous stages of development (evolution), nature developed matter from still to vegetative to animate. We also belong to the animate part of nature because we developed unconsciously. But on the next degree of “the speaking human being” (Adam – from the word “domeh,” similar to nature, the Creator), we have to rise consciously, attracting the force of nature on our own accord. In this way we become equal to it, as partners, rather than those who instinctively follow its orders from within. The wisdom of Kabbalah talks of how to rise to the next stage of development. That is why it was hidden until our time, waiting for the end of our instinctive (unconscious ) development. Question: How do you pray through the center of the group if you don’t feel this center? Answer: Pray as much as you can for the time being. A person is born lacking any understanding, like an animal, three kilos that come out of the mother and begin to develop. Gradually he grows and becomes wiser as he understands and feels more. Everything always starts from zero. The main thing is the quality and the exertion. “One may acquire his world in an hour.” This means that a person restricts and focuses his small exertion in the right place, and creates a lever. Although he has little power and cannot lift a heavy load, he can lift it if he increases the handle length of the lever. This means that a wise approach can shorten the time and help one gain power. In the past, loads were lifted onto ships by a system of chains and a pulley block. Many chains had to be pulled, but they were able to lift tons of cargo. It is the same in the spiritual work. I cannot directly approach Pharaoh and this whole confusion. But I am given a chance to organize a circle of physical bodies in this world, in a state where I am totally detached from spirituality and don’t belong to it. Then I am able to start thinking about physical connections with my corporeal brain, practically from zero, but not yet from a mental or spiritual perspective. I am given such an opportunity on every level. If I focus on the center of the group, by mutual guarantee, mutual responsibility, care, and support of others, in the connection between us, together with the teacher and the Kabbalah books, I can focus the relatively small effort I can make on one small point and thus break through. But if I disperse my efforts, it will lead to nothing; the outcome will be a serpent. This small point determines what the outcome will be, whether a serpent or a rod. This point is the focus on the center of the group, where we want to delight the Creator. Dissemination is based on being one man in one heart. The center of the group is our one common heart. We have to think about this option, about this form. But if I wander in endless directions, nothing will work. I will perform many actions, which will also eventually accumulate, but very slowly. I don’t gain anything and don’t shorten time. Question: What does our concentration on one action depend on? Answer: It depends on mutual work, on focusing, and on mutual support when everyone focuses in the heart and mind in our center and in our mutual connection. ARI Insitute‘s article on Israeli Independence Day was published by Aliya Magazine. Below is the article. “As another Israeli Day of Independence has been celebrated, the all too familiar chants (not to say rants) about Israel’s need to be strong and self-reliant fill the media. Perhaps the chanters know something most of us do not; otherwise, how can you explain their insistence that independence is possible? This is true for all countries, not just for Israel; independence is a myth; interdependence is the reality of our lives. It is a shame we take no pride in it. If we recognized its value, we would embrace it as our social code and our troubles would end. It may sound like a simplistic, perhaps naïve statement, but it works. Today’s reality is one of connectedness and mutual dependence, yet we fail to accept it as a way of life, and instead try to step over one another on our way to the top of the heap. But even once we get there, if we ever do, it only lasts a minute before someone else becomes the short-lived king of the hill. No other creature behaves this way but us, humans. And no other nation is as zealous about this game as us Jews, and especially the Jews in Israel. And since Israel is always at the center of attention, much to our dismay, we should at least embrace the opportunity to steer things in a positive direction. As proprietors of the abovementioned motto, it is our prerogative to employ it. 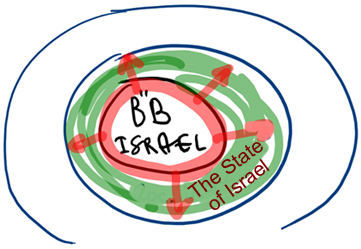 Question: All world problems are created because of separation among the people of Israel. The Bnei Baruch group is the center for correction of the world. What does the central group lack for connection in Israel itself? Answer: I don’t think that the problem is only in our group. It cannot be connected and united with the rest of the groups if they don’t help it and begin to be integrated into it. So this is not just about Israel, but about the one common world group. When we say that in Israel there is a unique atmosphere, we mean that here, in this nation, in this territory, there is an obligation first and foremost to offer people the method of the wisdom of connection. And in this, the central group, whose mission is to serve the people of Israel, is united. But around it there are other groups that must join us to help us and to push us. We need to receive power from each other. But first and foremost, we require the support of the other groups in order to disseminate the wisdom of connection among the people of Israel. And the rest of the groups must be doing this in their own territories. So the main thing is unity among the people of Israel. If we actualize the idea of unity here, this will spread further and encompass the whole world. For the inner network of connections between all people in the world are derived from here: The egoistic is derived from Babylon and the altruistic is derived from Israel. This link doesn’t exist now. Our mission is to create it. Question: On one hand, nature is not letting us breathe: wars, crises, and disasters. On the other hand, within the world group we cannot come to an agreement about dissemination projects. In addition to this, the number of friends hasn’t increased. Do we have enough time to do anything? Answer: Our power is not in quantity but in quality. That we are few is not important; that we cannot reach agreement is what has been a big problem. We don’t even need to think about the number of people: how many come, go, or remain. Our task is not to gather this year, let’s say, a million people around us. Our task is for our small group to be connected to the Creator, on one hand, and to society, to the world, on the other hand. First of all it must be qualitatively correct, and this is the main thing. Second, our lack of success in attracting people to us doesn’t indicate that they cannot be found in the world. Don’t complain that nobody wants to learn, that nobody wants to advance; people come and go. It could be that we are guilty of not talking in an interesting and understandable way; we don’t let a person feel that he needs to give and make an investment. We don’t show him what the benefit and progress is; we don’t explain that the characteristic of bestowal is most useful, most desirable, personally and generally. We devote little attention to working with every friend who comes so that he will understand that for humanity and for him there is no other way. Also, if we are talking about it, maybe it is with too technical of a language, not being concerned whether it will enter into a person and become his personal knowledge. The problem here is in the group and not in the friends that come and go. If the group complains that many are leaving it, this indicates that it has not found a way to work with people. Question: What is the difference between bestowing and receiving desires? Answer: The main difference is the intention. It should always be for the sake of giving. It is the intention that defines which desires are good to use. First, we restrict our desires, then depending on the strength, magnitude, and type of the intention, we work with the desires. The desire (stomach, heart) does not make a decision of whether or not it can be used; rather, it is the intention that makes this decision. Intentions encompass our joint aspiration to bestow as well as our neighbors’ desires. We calculate chances of filling other people’s will to receive. In other words, we use the desires of others to fulfill our neighbors. The work that precedes the action is called “bonding in thoughts.” Thus, one connects with one’s neighbor in their thoughts. Practical implementation follows. When we work with AHP’s will to receive, there has to be a bestowing intention above it. However, it is not just about elevating above the desire. We have to turn a desire upside down as if we plow the ground. We use our will to receive, AHP, and must sense pleasure inside it. We are capable of acting only because of the delight we feel. Let’s say you come to my place and I want to treat you. However, you reject my dishes and take a symbolic treat from the table. I went the extra mile cooking meat and fish for you, but you tried only a small piece of parsley. In other words, you try the treat I prepared for you, but it has nothing to do with what is called “using the will to receive.” This is how the bestowing desires work: You refrain from your egoistic desire; all you want is to please me. Although, you realize that I will be satisfied only if all of your intentions and desires are aimed solely to make me happy, if you ate meat and fish, you would inevitably sense pleasure for your own sake. However, there is a technique with the help of which even when you self-indulge you still feel pleasure only because your indulgence is aimed at the host’s benefit and pleasure. As of now, we can’t understand or imagine what’s behind these words. You continue eating, thus showing to the host that you enjoy the meal without any embarrassment or restraint. At the same time, your internal intentions are aimed solely at pleasing the host. Question: Why can we receive only in the bestowing desires? Answer: This is because after the first restriction happened, the will to receive stopped being a vessel that receives the Light. The intention for the sake of bestowal becomes the “vessel” since it is the condition that allows us to receive. In order to enjoy the meal, it is not enough to be hungry. Gradually, we will understand this concept. We come to realization of this fact as a result of the general crisis we are in. All of a sudden we feel that our desires to receive are empty. The emptiness doesn’t mean that our will to receive is not filled. However, we don’t regard or sense our current state as a fulfillment. What is missing? There is no purpose in our life. 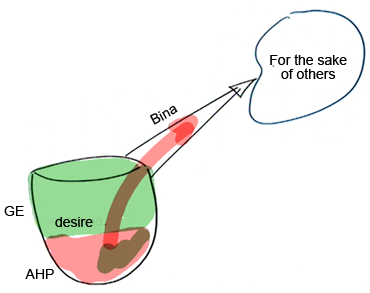 What Is A Spiritual Vessel (Desire)? What Will You Choose After All? We have always believed that we develop through our own powers without understanding that it is not by our own initiative, but comes from within nature. Now this inner power is lost and a person doesn’t know what to do. This is well illustrated in the younger generation that has no need for great achievements; it is not really bustling about or interested in anything, but simply prefers to pass the time and hang out. For the youth there is no longer that power that once drove us to build and to do great things. The youth lack interest and vigor, and all of this is the result of inner factors. The higher power doesn’t work within a person, doesn’t arouse him, but only organizes external environmental conditions. In this way, it is as if nature says to us that it is up to us to understand what kind of a world we are living in. We must think about what direction we want to go and what areas we want to develop. How do we get the power and the intelligence to develop and how do we realize this? Previously, it happened by itself in the mind and heart of a person, together with the supervision of the higher power that forced him to act instinctively. Because of this we saw how to develop, how to build our lives, to learn, to work, and what to pass on to our children. But today this is not done automatically, but is given to us as an act of grace. as a result, we begin to feel and to understand that previously the power of nature developed us and we ourselves knew where to turn. This desire was awakened in us by itself. But now it is not awakened and we begin to understand that indeed new times have come and we don’t understand what they want from us because we don’t want anything. This means that within us no desires have awakened. So what is there to do? Environmental conditions are becoming more and more difficult. Soon we will see that there is nothing to eat or drink, that it will be more and more difficult to build more or less acceptable living conditions. The environmental conditions will become worse and worse in order to obligate a person to choose a goal and a method of inner development. The person has apparently become the master of his life and fate, but how does he know how to manage it when everything, the nations, the societies, and people are connected to each other. This leads us to acquire a method for managing our lives. In all of the previous generations, a person was wise because a power, a desire, and different aspirations were awakened in him. Although he had confusion and doubted what kind of society and what kind of development to choose, he instinctively figured it out and knew how to construct his life. In our time, in this new state, it is up to us to attain everything from above, thanks to our efforts. But we don’t have a concept of how to get the inner part required for our development from above: the intelligence, the emotion, and the intention. We only know that we lack this and we cannot get along without this method that we receive from above. It previously worked instinctively, from within. But now in order to receive it, requires our preliminary work, effort, request, and prayer (MAN). So we require the wisdom of Kabbalah. But the way of natural development Beito (in its time) is long and difficult. This is called the “four hundred years of exile” until we pass through all the stages of inner development, phases 1, 2, 3 and 4, and then through blows and troubles, we discover the desired form. But together with this, it is no coincidence that the method of Kabbalah already exists in our world, was given to people, passed on to humanity, adapted and translated into many languages. So it is possible to use it, to study it, and to realize it in an organized and well-tested form. Then we will advance by the way of Achishena (I will hasten it). In this way we don’t need to go through those sufferings that we would go through if we were to advance by the way of in its time, by the way of all the phases of development. We acquire these discernments without suffering; it is said, “the Righteous takes his part and the part of his friend in the Garden of Eden.” All of this comes to us as a result of effort and connection. Through this we save a lot of time and suffering. This is our work. So we must develop widespread dissemination now, first of all to the people dwelling in the land of Israel and after that to the entire world. And all of this is so that humanity will not search blindly for the way of development, for this is liable to bring great troubles, like the previous development did through endless wars. Question: Prophets predicted that if the people of Israel fulfill their mission, the nations of the world will carry them on their shoulders. Then, why did we see that the Jewish people resisted Moses who tried to follow his mission? Answer: Prophet Yeshayahu writes that the nations of the world will carry the sons of Israel on their shoulders to Jerusalem to have them build the Temple. “The Temple” signifies the state of connectedness among the people of Israel. It means that they become a spiritual nation that works as the Light for the nations of the world. The nations of the world lack the points in the heart; that’s why they are called “the nations of the world.” However, they still will join us because they regard our connection as the only opportunity for redemption. They connect with the people of Israel. However, today there is no such nation as the people of Israel. We haven’t reached the state of connectedness among us. After we spiritually unite with all of our world groups, all whose points in the heart have already awakened, this prophecy will come true. I hope we will see this trend much sooner. Recent tremendous strengthening of anti-Semitism throughout the world demonstrates that we have to hurry up in our work. If we succeed, we’ll see that the people of Israel are really capable of uniting and correcting the vessel. The negative rate of the development of Israel is so great that if we continue working at the same pace, we will soon attain unity among the people of Israel. The negative line is ready and increases everywhere in the world. We have to present the right line as soon as possible to oppose the negative line. In other words, we have to disseminate the methodology of unification as the means of salvation. The people of Israel will feel the increasing pressure shortly; it will start at the borders and spread throughout the world. In contrast, we have to provide the knowledge of why this is happening: this corresponds to the program of development. There is no other choice. We can only exist in the form of unity. The entire methodology will materialize and be implemented in practice. Question: Who should I ask for support, the Creator or the group? Answer: First you should ask the group for support. If I turn to the group, I begin to feel the upper force inside it. If I turn directly to the upper force, then it is just my imagination. It is just like the whole world that cries and prays in all languages, in all the religions and faiths, but we see that nothing helps. I, on the other hand, turn to the force of bestowal, being in the system that aims to complete bestowal. Then I really come closer to the Creator and can be sure that I am asking the force of bestowal and not something else. The group helps me arrange my appeal correctly by organizing and formatting it in the right form and the right direction needed for the revelation of the upper force. I enter this form, this pattern, that focuses me directly to the Creator. This means that I reach Him through the Shechina (Divinity), through Malchut of Atzilut and this is the only way one can reach Zeir Anpin of Atzilut, which is called “the Holy and blessed,” the Creator. There is no other way I can reach Him. We see that the whole world reads Psalms and cries and weeps, but life goes on the way it does, unchanged. It is only by performing an action through the center of the group that we can be in the right place. We are constantly in the system. Our desire has been developing for millions of years on the levels of the still, vegetative, and animate until we reach the form of a human being in this world, and now a desire to ascend above the animate level is finally beginning to awaken in us. The same system is constantly working.